I am not really a dedicated fan of the horror genre any more (although I was pestered by many an English teacher for never branching out of my little box of horror as a teenager), and it is particularly rare to see me reading things from that genre. I have a penchant for Gothic fiction - especially good ol' 19thC Gothic - but that's for another post! But you know, no matter how hard I try to fight it, I do love to read horror... but only if it is written by Stephen King. What I appreciate most about his writing is that King exhibits a freakishly absurd understanding of the human condition, and with perfect command, deciphers and reveals both the psychologies and motives of his characters. To put it in the most cheesy way possible - King is master of his pen, the pen is not master over him. I'll give you a perfect example. 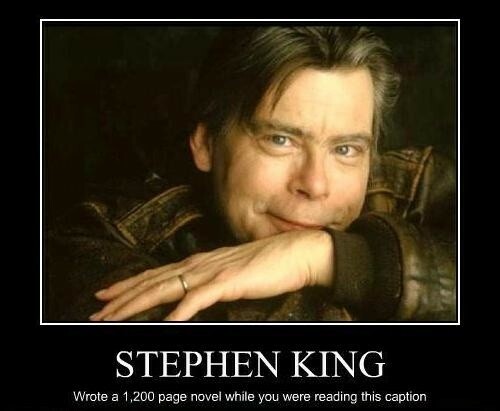 King is the only author, ever, in my reading history who has ever physically compelled me to close a book and stop reading because I was so freaked out. That may sounds nuts, but I remember a particular moment in Salem's Lot  that took place in a prison cell that had my hair standing on end! I closed the book and took a twenty minute break before I went back to it. I was overwhelmed, not just by the creepiness, but also by the very fact that no book had actually made me look away before. Under the Dome  (though I would consider that more of a sci-fi novel rather than a horror) also had moments that chilled my bones, and characters so repulsive and uncomfortable that I would pause the audiobook to give myself a break. King is quite simply a prolific writer, and can churn out a book or two a year. Needless to say, some of those books are just not as good as others, but his good books are just so, so good - I can ignore the bad ones. One of the greatest things about King are his unashamedly philosophical undertones that are present within his writings. King is a political-animal and this shows both in and out of his writing. Carrie , Misery , Under the Dome, Firestarter  and his Dark Tower series [1982-2012] (please forgive my adding the Dark Tower books as they're sci-fi, but there are some truly horrifying scenes within it) all carry philosophical or recurring political themes. From where I've been standing, and it is probably because I am biased and not a great consumer of horror as I once was, but the horror genre has pretty much stagnated. I've not seen any great morphing, either within literature or even on the big screen. Horror has had paranormal-romance grow out of it and leave the nest, it's had gore which is now a genre all on its own, but horror, horror is sat waiting for somebody to notice it. Stephen King, who is arguably one of the most well known horror writers of our day is not really considered high-literature. His books are not being clutched in the hands of housewives at books clubs, or had Oprah Winfrey jumping on her couch about them, but I believe a lot more credit should be thrown King's way. After all, some of the best and most horrific characters within our collective memories were his own gruesome creations (Annie Wilkes, It (Pennywise), Carrie, Big Jim Rennie, Jack Torrance and of course Cujo).